Osteoblasts form a thin, transversely oriented bony template on the underside of the zone of proliferative cartilage that has stopped growing during the period of stress or illness. Bone Within a Bone. The patient had been studied with thorium dioxide (Thorotrast) many years earlier. Thorotrast was used as a radiologic contrast agent but it itself was radioactive. 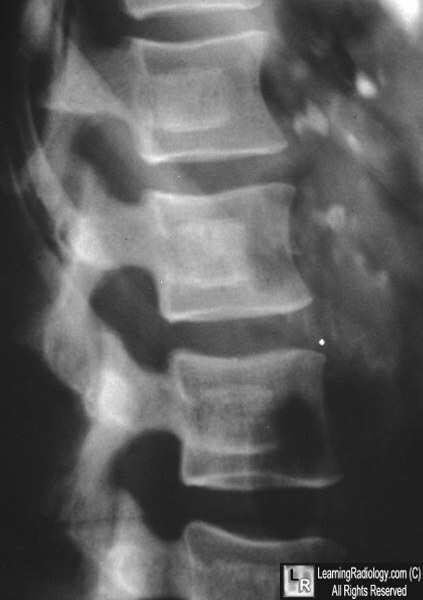 The changes in the spine are thought to be due to radiation osteitis. The dense lymph nodes anterior to the spine still contain Thorotrast 30 years after its use. Bone within a bone. HJ Williams, AM Davies AM, and S Chapman. Clin Radiol. 2004 Feb;59(2):132-44.